Had a great vacation here. We go to club med- because the kids enjoy the many activities at kids club and great GM that make it a great time for them. No just watching TV or movies here. we also enjoy the many adult activities- we can all do different things - Tennis, volleyball, sailing, kayaking. The tennis coaches are great fun and we made sure we did a lesson daily. Food is decent - we enjoyed the Asian offerings the most. Mango sorbet was excellent. - we paid extra for a room near zen oasis, this had a great view. But it was very loud at night as it was next to theatre and the nightclub. I regret doing this. - there is only 1 place to get towels. You have to walk far for this. They need to build more. - there should be some pilates or zumba classes mid morning, they are early while we are dropping kids. Room tip: don't get one near zen oasis- too loud. The price you found is 39% lower than this hotel's average rate of $308/night. The price you found is 12% lower than this hotel's average rate of $502/night. 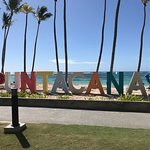 Our second time to Punta Cana and again we stayed at Zen Oasis. We love it! We were met by Wiled and he was so incredibly helpful. All he wanted to do was make you have a great trip. The zen oasis area is amazing. So calm and peaceful. Everything you can imagine. We were glad that this year the smoking seems to be more controlled. Our room did. It smell like smoke . And we didn’t see may people smoking. The pool area is amazing. Never a problem finding a chair. We loved our room although we did note some wear and tear on furniture since last year. And the absence of L’Occitane products no longer in room was definitely noticed. It appears they are cutting corners. The restaurant was up to par. Loved the adult only section and even the wines were good. The new healthy section was a nice addition but they need to have more attractive farm to table foods available. Many were in recognizable. But a nice try. The CDV Pierre- Jean is visible all over the club. He does a great job naming himself known and being friendly. We enjoyed his company very much. The club is large but doable. Walking all over is completely fine. We never once felt crowded. Which is great. We honestly love this place even though it is mostly French. It has a very international feel which we like. It seems everyone speaks English. Although we wish Coffee games was more English friendly. We love trivia and felt a little left out. Last year was much better as far as that goes. We got demoted from our gold status to silver. This program is so silly and so hard to keep track of where you are at. They need to recreate the program. Benefits aren’t great anyway. Seriously if we hadn’t been brought up with club med we would have moved on by Now. So many better places. But something keeps bringing us back. Shout out to Fritznel at Zen bar and Leuril at guest relations. Very friendly and hospitality. Hopefully we can return again next year. 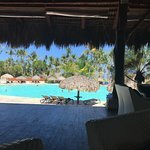 This is our 4th Club Med visit and the best so far! 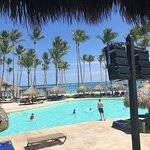 Punta Cana is a beautiful resort with amazing turquoise water, velvet sand, coconut trees with unobstructed water views thoughout. There was some seaweed on the beach but they worked to keep clearing it off. 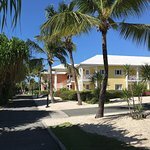 Although it was the biggest Club Med, we did not feel cramped at all and resort was well maintained and kept clean. 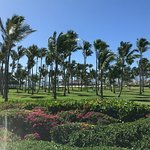 The resort is well spread out but nothing is too far and if you are tired there is always a golf cart waiting to take you back to the room at the end of evening. Pierre-Jean, the Chef de Village and his staff were readily available anywhere, funny and absolutely fantastic. We had difficulty locating our daughter one evening and when we approached Pierre-Jean, he dropped everything and jumped on it and made several calls and within a few minutes we found her (she had wandered off with other kids to see a show). The Cirque team was absolutely amazing and it felt like we were watching a Cirque du Soleil show. Food was remarkably tasty with a lot of variety, especially the desserts and the BBQ. The Indigo bar was great with unforgettable views, drinks and music. The water activities were fantastic with amazing kitesurfing. Paddle boarding was a bit tough with the wind and currents but still enjoyable. We rented a boat to go snorkeling and tubing. We were disappointed with the snorkeling as there were hardly any fish and current was too strong but the tubing was amazing and made up for it. Stephanie and Jose were great on the boat. Special shout out to Toto, Nelson, Kiki and Eloise from the mini-club. Alex and his Sports team were fantastic especially Yoni, Stephanie, Micka and Eric from Landsports. Great entertainment and music. The White Party on Friday was special. The entire GO and GE team seemed very engaged, always smiling and truly cared that everyone had a good time. We were sad to leave and would love to go back. Merci beaucoup!